With the recent industrial expansion, heavy metals and other pollutants have increasingly contaminated our living surroundings. The non-degradability of heavy metals may lead to accumulation in food chains, and the resulting toxicity could cause damage in organisms. Hence, detection techniques have gradually received attention. In this study, a quorum sensing (QS)-based amplifier is introduced to improve the detection performance of metal ion biosensing. The design utilizes diffusible signal molecules, which freely pass through the cell membrane into the environment to communicate with others. Bacteria cooperate via the cell-cell communication process, thereby displaying synchronous behavior, even if only a minority of the cells detect the metal ion. In order to facilitate the design, the ability of the engineered biosensor to detect metal ions is described in a steady-state model. The design can be constructed according to user-oriented specifications by selecting adequate components from corresponding libraries, with the help of a genetic algorithm (GA)-based design method. The experimental results validate enhanced efficiency and detection performance of the quorum sensing-based biosensor of metal ions. Metal ions play important roles in biological metabolic pathways and affect cellular processes through a wide variety of reactions. Organisms require metal ions, which are involved in processes, such as bacterial respiration, electron transport, and peroxide reduction (Achtman and Suerbaum 2001). The uptake and efflux systems in biology regulate ion homeostasis to prevent a lack or excess of metal ions. With the recent industrial expansion, there has been either an excess of metal ions in wastewater (Ngah and Hanafiah 2008; Rezvani-Boroujeni et al. 2015; Singha and Guleria 2014; Teodosiu et al. 2014; Mulligan et al. 2001) or the intentional or careless discharge of other contaminants (Migaszewski and Galuszka 2015) into the natural environment. Metal ions can be classified based on their effects and toxicity on cells into essential ions, trace ions, and heavy metals. The stronger redox ability of heavy metals allows them to compete with essential ions and trace ions in redox actions, leading to superoxide or hydroxyl radicals (Hartwig 1995). Superoxide and hydroxyl radicals may damage lipids and proteins (Davies 2005; Raha and Robinson 2000), disrupt DNA oxidation (Hartwig 1995), and even cause cell death (Hartwig 1995). Furthermore, heavy metals are difficult to remove via metabolism and can accumulate in organs, causing permanent damage. Hence, detection techniques have gradually received great attention. In this chapter, we introduce a synthetic genetic circuit that can enhance the detection performance of metal ion biosensors and has the potential to be applied for environmental detection and environmental bioremediation. Recent progress in research on synthetic biology (Chang et al. 2013; Danino et al. 2010; Khalil and Collins 2010; Silva-Rocha and de Lorenzo 2014; Sohka et al. 2009; Stricker et al. 2008; Wang et al. 2011; Cameron et al. 2014; Kotula et al. 2014; Teo et al. 2015) has provided an alternative means for metal ion detection aided by specific promoter elements such as derived from R. metallidurans (Taghavi et al. 1997; Hobman et al. 2012) or found in E. coli (Munson et al. 2000). 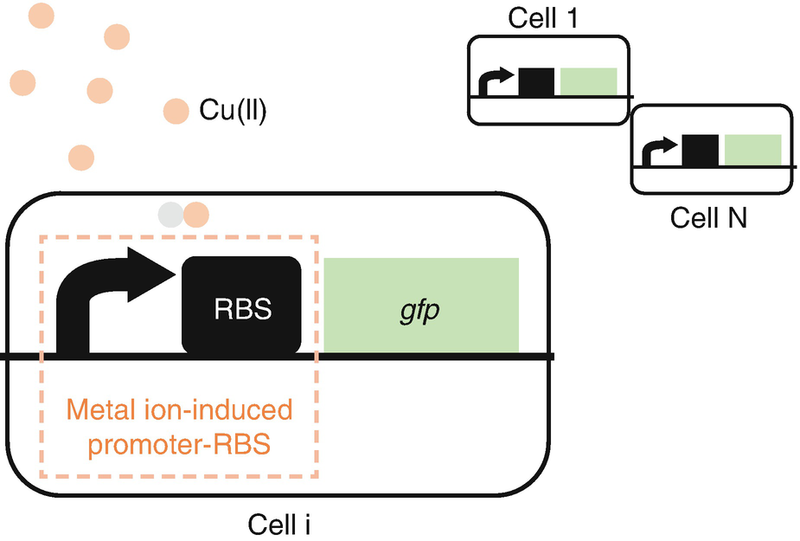 In order to improve the detection performance, a metal ion-induced promoter connects to bacterial quorum sensing (QS) system. Quorum sensing is a mechanism which regulates gene expression for many functions through cell-cell communication (Brint and Ohman 1995; Darch et al. 2012; Miller and Bassler 2001; Passador et al. 1993; Pearson et al. 1995). Bacteria produce diffusible signal molecules, generally known as autoinducers (AIs) (Kaplan and Greenberg 1985; Dunlap and Kuo 1992; Fuqua et al. 1994; Ruby and Mcfallngai 1992; Ruby and Nealson 1976), and release them into the environment to communicate with others. Through this process, bacteria cooperate and thereby display synchronous behavior. The most extensively studied quorum sensing system is the autoinduction of luminescence in the marine bacterium, Aliivibrio fischeri, which is symbiotic with squids and some marine fishes (Ruby and Mcfallngai 1992; Ruby and Nealson 1976; Nealson and Hastings 1979). The luminescence here is produced by the operon acquired from V. fischeri, of which the LuxR protein is the transcriptional activator of luminescence and the LuxI protein synthesizes the specific N-acylated homoserine lactone (AHL) (Engebrecht and Silverman 1984; Hanzelka and Greenberg 1996; Val and Cronan 1998). After the LuxR protein binds AHL to form a complex, the complex can bind the target promoter sequence and activate downstream gene transcription, even if only some of the bacteria can detect the metal ions. Thus, it can be employed to enhance the detection performance by signal amplification. To make the design of the QS-based metal ion biosensor easier, we introduce a mathematical model to describe the dynamic and steady-state regulatory behavior, which is related to transcriptional and translational processes (Chen and Wang 2014). A promoter allows RNA-polymerase molecules to latch onto a DNA strand and initialize transcription of a downstream gene into mRNA, and a RBS allows ribosome to bind and translate mRNA. 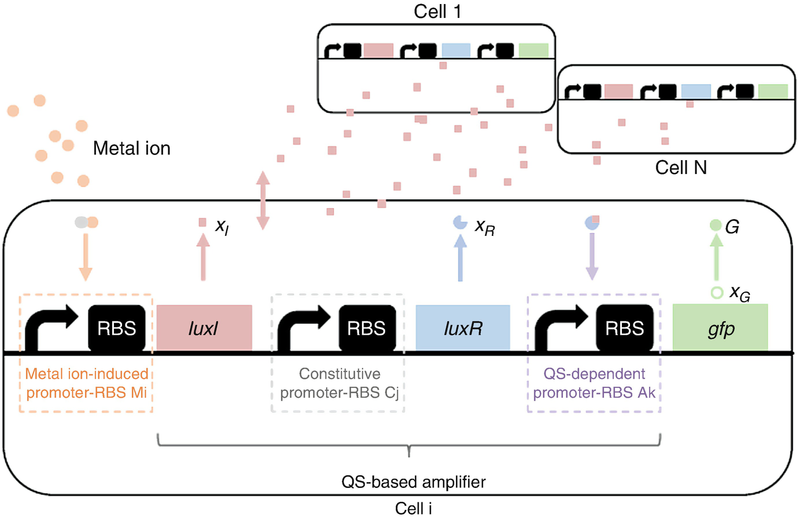 A promoter combined with a RBS thus in this study is viewed as a component, of which characterizations can be identified with a reporter protein by measuring the fluorescence intensity. One can therefore use kinetic parameters as component libraries to design the circuit for QS-based metal ion detection. The design can be constructed according to user-oriented specifications by selecting adequate promoter-RBS components within a feasible range of metal ion concentrations. A long computation time is required in general when the component libraries become large. Hence, a genetic algorithm-based design method proposed here provides a simple and useful tool that saves time in evaluating and selecting components. So in summary, this study provides a systematic methodology for developments in next-generation synthetic biology, from component library construction to gene circuit assembly. When the libraries are more complete, more precise detection can be achieved. 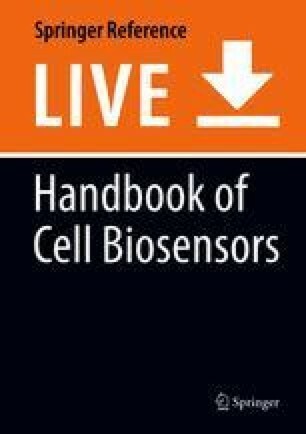 The purposes of this chapter are fivefold: (a) The basic principles of quorum sensing are introduced as the basic background of quorum sensing-based biosensor. (b) A QS-based amplifier is introduced into a biosensor to enhance the ability for metal ion detection. (c) Based on the promoter-RBS kinetic strengths, we establish three kinds of component libraries. (d) According to user-oriented specifications, the quorum sensing (QS)-based metal ion biosensor can be constructed by selecting adequate promoter-RBS components from the corresponding libraries to achieve a desired ability for metal ion detection. (e) The proposed methodology could provide synthetic biologists with a useful tool to design metal ion biosensors. Before we discuss the systematic design of a quorum sensing-based biosensor for detection of metal ion in E. coli, the basic principles of quorum sensing involved in using this phenomenon are described as the basis for biosensor design and construction in the following. Quorum sensing was discovered and described in two luminous marine bacterial species over four decades, i.e., Aliivibrio fischeri and Vibrio harveyi (Achtman and Suerbaum 2001; Ruby 1996). In both species, the enzymes responsible for light production are encoded by the luciferase structural operon lux CDABE (Achtman and Suerbaum 2001; Miller and Bassler 2001; Ruby 1996), and light emission was determined to occur only at high cell population density in response to the accumulation of secreted autoinducer signaling molecules (Ruby 1996). Only a few other cases of bacterial regulation of gene expression in response to cell-cell signaling were known, for example, antibiotic production by Streptomyces spp., conjugation in Enterococcus faecalis, and fruiting body development in Myxococcus xanthus which were also recognized to be controlled by intercellular signaling. Therefore, these bacterial communication systems were considered anomalous because bacteria as a whole were not believed to use cell-cell communication in general. However, the exchange of chemical signals between cells and organisms could be assumed to be a trait highly characteristic of eukaryotes (Ruby 1996). In the recent explosion of advances in the field of cell-cell communication in bacteria, many or most bacteria have been shown to communicate using secreted chemical molecules to coordinate the behaviors of the group. Furthermore, a vast assortment of different classes of chemical signals have been employed that individual species of bacteria use more than one chemical signal and/or more than one type of signal to communicate. Therefore complex hierarchical regulatory circuits have evolved to integrate and process the sensory information, and the signals can be used to differentiate between species in consortia. Obviously, the ability to communicate both within and between species is critical for bacterial survival and interaction in natural habitats (Miller and Bassler 2001; Ruby 1996). In the past decades quorum sensing circuits have been identified in many species of Gram-negative bacteria. The quorum sensing circuits identified in Gram-negative bacteria resemble the canonical quorum sensing circuit of the symbiotic bacterium V. fischeri. Specifically, these Gram-negative bacterial quorum sensing circuits contain homologues of two V. fischeri regulatory proteins, i.e., LuxI and LuxR, at least. The LuxI-like proteins respond for the biosynthesis of a specific acylated homoserine lactone signaling molecule (HSL) known as an autoinducer. The autoinducer concentration will increase with the increase of cell population density. The LuxR-like protein could bind cognate HSL autoinducers that cause achieved a critical threshold concentration, and the LuxR-autoinducer complexes could also activate target gene transcription (Miller and Bassler 2001). Therefore, using this quorum sensing mechanism, Gram-negative bacteria could efficiently couple gene expression to fluctuations in cell population density. Among these species of bacteria that could mediate quorum sensing by means of a LuxI/LuxR-type circuit, the V. fischeri, Pseudomonas aeruginosa, Agrobacterium tumefaciens, and Erwinia carotovora systems are the most understood (Miller and Bassler 2001). The most intensely studied quorum sensing system is the bioluminescent marine bacterium V. fischeri. This bacterium lives in symbiotic association with a number of eukaryotic hosts. In each case the host has developed a specialized light organ that is inhabited by a pure culture of a specific strain of V. fischeri at very high cell density. In these symbiotic associations, scientists have found that the eukaryotic host supplies V. fischeri with a nutrient-rich environment in which to live. The role of V. fischeri could provide the host with light, and then each eukaryotic host uses the light which is provided by the bacteria for a specific purpose. For example, in the squid Euprymna scolopes and V. fischeri association, the squid has evolved into an antipredation strategy in which it counters and illuminates itself using the light from V. fischeri. In contrast, the fish Monocentris japonica could use the light produced by V. fischeri to attract a mate. Other uses of the V. fischeri light, such as warding off predators and attracting prey, have been documented (Miller and Bassler 2001). In general, V. fischeri culture grows to extremely high cell densities, reaching 1011 cells per ml (Ruby 1996). As V. fischeri culture grows, it could produce and release an autoinducer hormone into the extracellular environment, and the hormone is trapped inside the light organ with the bacteria. 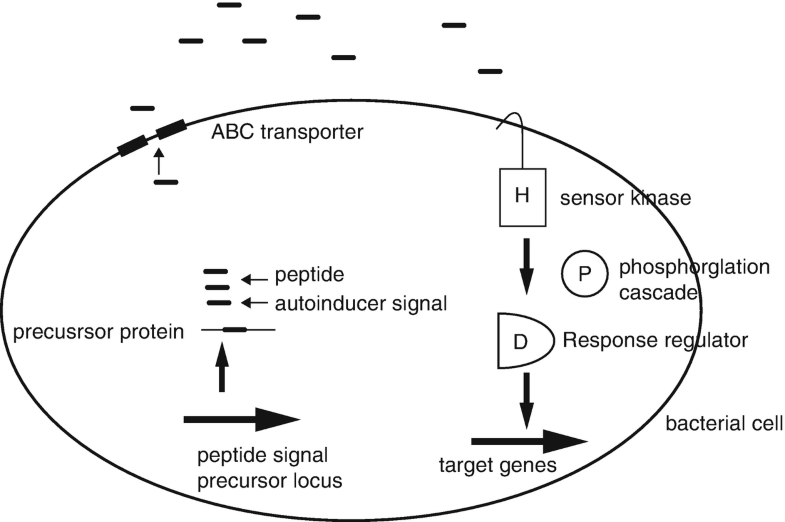 Detection of autoinducer by V. fischeri could elicit a signaling cascade that can cumulate in the emission of light. Thus, the quorum sensing system of V. fischeri has evolved to specifically enable the bacteria to produce light only under conditions in which there is a positive selective advantage for the light (Miller and Bassler 2001). As mentioned above, the luciferase enzymes required for light production in V. fischeri are encoded by luxCDABE, which exists as part of the luxICDABE operon. Two regulatory proteins called LuxI and LuxR comprise the quorum sensing apparatus. As shown in Fig. 1, LuxI is the autoinducer synthase enzyme, and it acts in the production of an HSL, N-(3-oxohexanoyl)-homoserine lactone (Ruby 1996). LuxR functions both to bind the autoinducer and to activate transcription of the luxICDABE operon as shown in the quorum sensing system of V. fischeri in Fig. 1. Specifically, at low cell densities, the luxICDABE operon is transcribed at a low basal level. 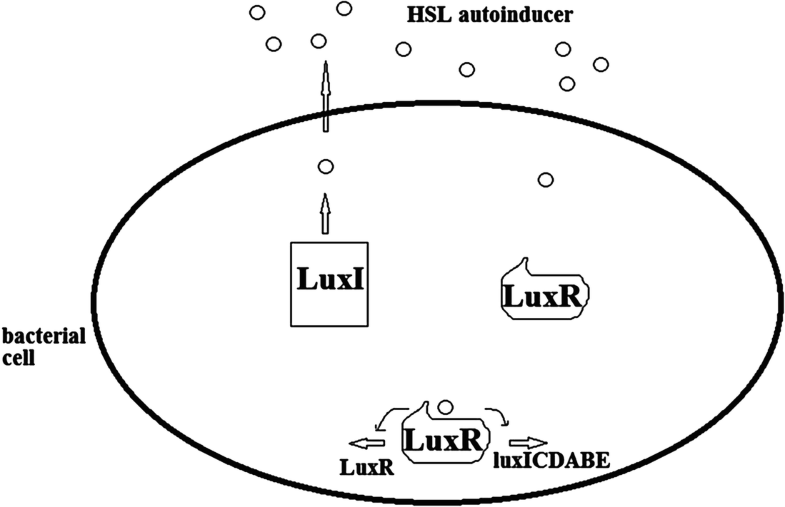 Therefore, a low level of autoinducer is produced via luxI, and because the genes encoding luciferase are located directly downstream of the luxI gene, only a low level of light is produced. The HSL autoinducer is freely diffusible across the cell membrane, so the concentration of autoinducer in the extracellular environment is the same as the intracellular concentration of the autoinducer (Miller and Bassler 2001). As the V. fischeri culture grows, autoinducer accumulates to a threshold level that is sufficient for detection and binding by the cytoplasmic LuxR protein. In this situation, the interaction of LuxR with the autoinducer unmasks the LuxR DNA-binding domain, allowing LuxR to bind the luxICDABE promoter and activate its transcription. This action results in an exponential increase in both autoinducer production and light emission. The LuxR-HSL complex also acts to negatively regulate the expression of LuxR. The negative feedback loop is a compensatory mechanism that decreases luxICDABE expression in response to the positive feedback circuit (Miller and Bassler 2001). After we learn how quorum sensing facilitates species-specific and interspecies cell-cell communication, how quorum sensing allows populations to act synergistically, and how quorum sensing can be used to conquer competitors, we could learn about an assortment of the signals that are employed by bacteria and about the biosynthesis of these signals as well as how the information encoded in these chemical signals is processed and transduced to control gene expression. These basic principles of quorum sensing will be employed for systematic design of a quorum sensing-based biosensor for the metal ion in E.coli in the following sections. In biosensor reagents, all restriction enzymes and DNA ligation kit are purchased from New England Biolabs. The chemicals used here are from Sigma-Aldrich. The oligonucleotides are from Integrated DNA Technologies. 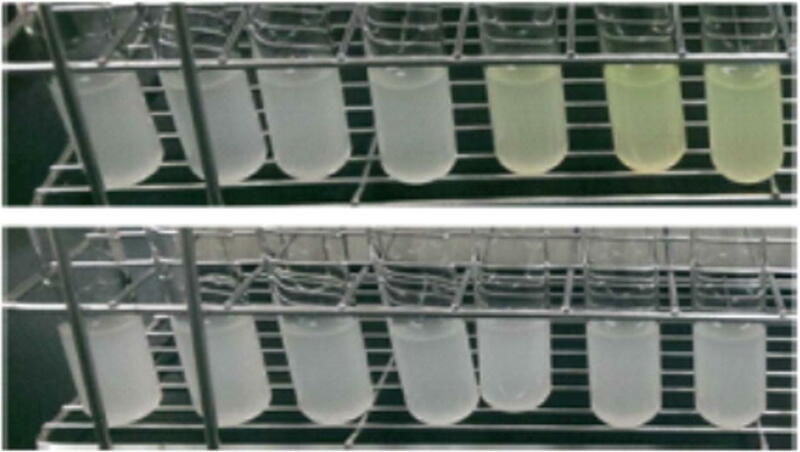 In bacteria strains and medium, Escherichia coli strain DH5α cells from Yeastern Biotech (ECOS) are used for the construction of the procedure and for the fluorescence measurement experiments. An M9 working medium (34 g/L Na2HPO4, 15 g/L K2HPO4, 2.5 g/L NaCl, 5 g/L NH4Cl, 2 g/L casamino acids, 2 μM vitamin B1, 2 mM MgSO4, 0.2% glucose) with proper antibiotics is used for E. coli cultivation at 37 °C and 200 r.p.m. In the plasmid construction, the DNA parts used in this study are selected from BioBrick or synthesized by MDBio Biotech Co. Ltd. All DNA parts are assembled into the backbone pSB3K3 (20–30 copies per cell), via the BioBrick standard assembly method. In the fluorescence measurement, the cells containing the genetic circuit are inoculated in the M9 working medium with 50 mg/mL kanamycin. The culture is incubated for approximately 14–16 h, after which it is diluted 250-fold and further incubated until the OD600 reaches 0.1. Different concentrations of CuSO4 are then added to the medium. The fluorescence intensity of the culture is measured subsequently by the microplate reader (BioTek, Synergy H1, GFP settings are 490/510 nm for excitation and emission). Recent research on synthetic biology offers an alternative means for metal ion detection using specific promoter elements derived from microorganisms. For example, PcusC and PpcoE are copper-inducible promoters regulated by CusRS, which are a part of the E. coli chromosome system and system, respectively (Bondarczuk and Piotrowska-Seget 2013). The system (cusCFBA) found in E. coli is a tetrapartite system endowing resistance to copper ion and is involved in periplasmic copper detoxification (Franke et al. 2003). The system (pcoABCDRSE) is discovered in bacteria that survive in copper-rich environments; plasmid-encoded operons in this system are known to be responsible for resistance to copper toxicity (Rouch and Brown 1997; Lee et al. 2002; Tetaz and Luke 1983). Another example of a metal ion-regulated promoter is the lead resistance promoter (Taghavi et al. 1997). The promoter is acquired from Ralstonia metallidurans strain CH34 isolated from lead-contaminated soil, containing at least seven determinants encoding resistances to toxic heavy metals (Taghavi et al. 1997; Hobman et al. 2012). Combining functions involved in uptake, efflux, and accumulation of Pb(II) ion, the lead resistance operon (pbrABCDRT) is regulated by PbrR, which belongs to the MerR family of metal regulatory proteins (Borremans et al. 2001; Brown et al. 2003). To improve the detection performance, a metal ion-induced promoter-RBS Mi is connected to the LuxI protein-coding sequence (in Fig. 3). This allows the LuxI protein to be translated by the activation of the metal ion-induced promoter. The luxI component derived from the lux operon in V. fischeri is involved in the production of the LuxI protein, which catalyzes S-adenosyl methionine and acyl-acyl carrier protein into a specific AHL (referred to as HSL) as signal molecules (Hanzelka and Greenberg 1996; Val and Cronan 1998). HSLs may be classified into several types according to acyl group length (C4–C18). Here, the type of HSL synthesized by LuxI protein is C6-HSL. Because the lux operon is an exogenous DNA sequence for Escherichia coli (E. coli), it is required to supply LuxR protein for the activation of promoter Plux. The LuxR protein-coding sequence is connected to a constitutive promoter-RBS component Ci. When sufficient amounts of the LuxR protein is produced using a constitutive promoter-RBS component with the presence of C6-HSL, C6-HSL can then bind LuxR protein to form the LuxR complex. The complex targets the cognate QS-dependent promoter-RBS component Ak and activates the transcription of the green fluorescent protein (GFP) coding sequence, even if only some of the bacteria can detect the metal ions. This mechanism is helpful to enhance the detection ability by signal amplification. To construct the dynamic model, promoter-RBS regulation must be introduced. The promoter-RBS regulation function is first defined by P(Pu, Pl, TF, I), in which Pu and Pl denote the maximum and minimum promoter-RBS strengths, respectively, TF denotes transcription factor concentration, and I is inducer concentration. This function describes the biochemical aspect of the transcription and translation process. The dynamic model of the metal ion biosensor with QS-based amplifier in Fig. 3 is thus described as follows. Note that the QS-based metal ion biosensor is divided into three stages. where xI is the concentration of autoinducer, a is autoinducer synthesis rate, and rI denotes the degradation rate for autoinducter. where xR denotes the concentration of transcriptional activator protein, LuxR. j is the jth constitutive promoter-RBS component in Table 2. PC(Pu, j, 0, 0, 0) is the regulation activity of the constitutive promoter-RBS components. Pu, j is the promoter-RBS strength of the jth constitutive promoter-RBS component in Table 2. rR denotes the degradation rate for transcriptional activator protein. where m is the maturation rate for the reporter protein and r is the degradation rate for mature reporter protein. where xISS, xRSS, xGSS and Gss are the steady-state concentrations of autoinducter, transcriptional activator protein, and immature reporter protein, as well as steady-state mature reporter protein, respectively. The steady-state expression of the QS-based metal ion biosensor can be obtained from the steady-state model in (6) with the regulation functions PM(Pu, i, Pl, i, xS, IM), PC(Pu, j, 0, 0, 0), as well as PA(Pu, k, Pl, k, xR, xI), respectively. where ΔPu, i, ΔPl, i, ΔPu, j, ΔPu, k, ΔPl, k, ΔrE, ΔrR, ΔrG, Δm, Δr, and Δd are the standard deviations of the corresponding stochastic parameters and nq(t), q = 1, 2, … , 11 denote Gaussian noise, which have zero mean and unit variance, and account for random fluctuation sources. If the kinetic parameters in the steady-state model in (7) are replaced by the parameter perturbations shown in for robust design of the gene circuit, then the QS-based metal ion biosensor can tolerate these fluctuations in vivo, i.e., a design that accounts for (8) should be able to tolerate the parameter fluctuations. where S denotes the set of promoter-RBS components Mi, Cj, and Ak to be selected from the corresponding libraries in Appendix. If the cost function in is minimized by choosing the most appropriate set of components under design specifications, the fluorescence intensity of an engineered metal ion biosensor will be as close as possible to the specified steady-state fluorescence intensity under parameter fluctuations and environmental noise optimally. Although the cost function J(S) can be minimized by traditional conventional search methods, it will require long computation times and several trial-and-error experimentations when component libraries become large. Thus, a more effective and efficient genetic algorithm (GA)-based searching method is proposed here to save time in evaluating and selecting adequate promoter-RBS components from corresponding libraries in Appendix. Provide user-defined design specifications Gref(IM) for the quorum sensing-based metal ion biosensor. Select an initial set S of promoter-RBS components from the corresponding libraries. Create an offspring set S, using GA operators such as reproduction, crossover, and mutation (Chen et al. 1995). Make copies of possible solutions, on basis of their fitness. Swap values between two possible solutions. Randomly alter the value in a possible solution. Calculate the cost value of the new set S obtained by natural selection. Stop when the design goal is achieved or an acceptable solution is obtained due to a limited number of components available from the libraries. Otherwise, create the next generation and return to step 3. Input operation range: 10−3 to 100 μM (National Technical Information Service 1980). and the external environmental noise vp, p = 1, 2, 3, for transcription and translation processes, and noise v4, for mature reporter protein expression, are all Gaussian, with zero mean and unit variance. In order to efficiently solve the constrained optimal matching design problem of the metal ion biosensor, a GA-based library search method is employed to search a set S from corresponding libraries in Appendix to minimize the cost function (14). The adequate promoter-RBS components from the corresponding libraries in Appendix are found to be M1, C6, and A3. 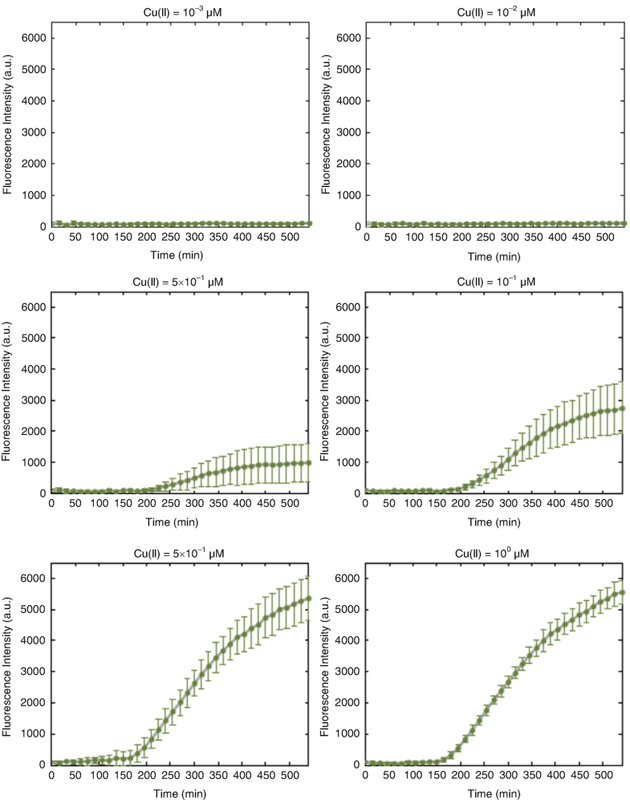 The desired response is shown in Fig. 2, with the fluorescence intensity values taken from Fig. 3 under different Cu(II) ion concentrations. Clearly, the metal ion biosensor can be as close as possible to the specified I/O response despite the parameter fluctuations and environmental noise. Besides, the detection performance is better than that without quorum sensing-based amplifier in Fig. 4 (see “Appendix” for mathematical details) at the same copper ion concentrations (see Figs. 5 and 6). 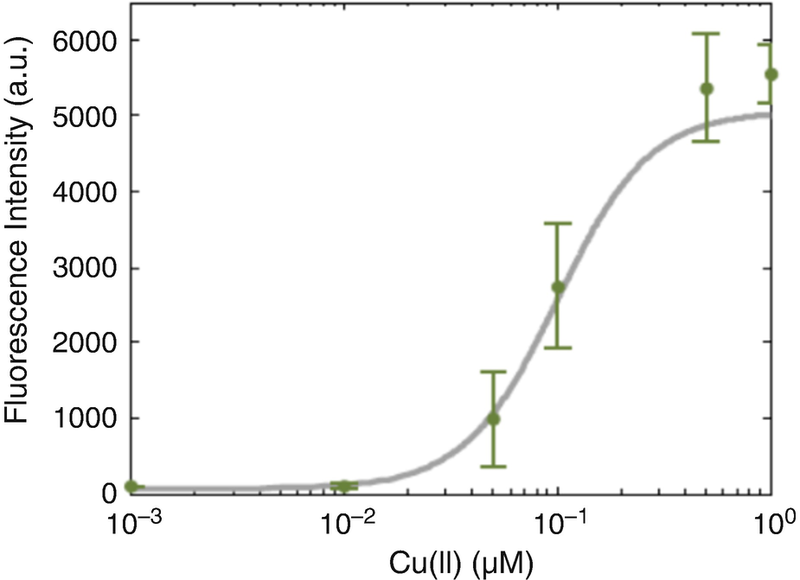 In particular, the QS-based metal ion biosensor increases the sensitivity to Cu(II) ion by roughly one order of magnitude and the dynamic range by roughly fourfold. It confirms the quorum sensing-based metal ion biosensor is useful for enhancing the detection ability (Figs. 7 and 8). In this chapter, a QS-based biosensor is constructed to improve the performance of metal ion detection. Based on four design specifications, the QS-based biosensor can be constructed by selecting adequate promoter-RBS components in combination with a feasible range of metal ion concentrations. The proposed GA-based searching method could provide synthetic biologists with a useful tool to save time in selecting adequate promoter-RBS components to meet a specified detection performance. The experimental results confirm that the quorum sensing-based biosensor can efficiently enhance the performance in metal ion detection. In the future, the mechanism of metal ion detection can be used for environmental bioremediation (Wang and Chen 2009). Bioremediation, which utilizes the ability of biosorption (e.g., protein) to bind the ions using biomass or biopolymers, is a promising approach for environmental treatment. Proteins for biosorption are extensively studied for their specific binding regions and are engineered as biosorbent because of their higher adsorption capacity, low cost, and reusability (Wang and Chen 2009; He and Chen 2014). Research indicates that biosorbents contain a variety of functional sites including carboxyl, phosphate, amino groups, etc., and biology materials, like bacteria, yeast, and fungi, have gained attention for their removal and recovery abilities (Wang and Chen 2009; He and Chen 2014). Ravikumar et al. 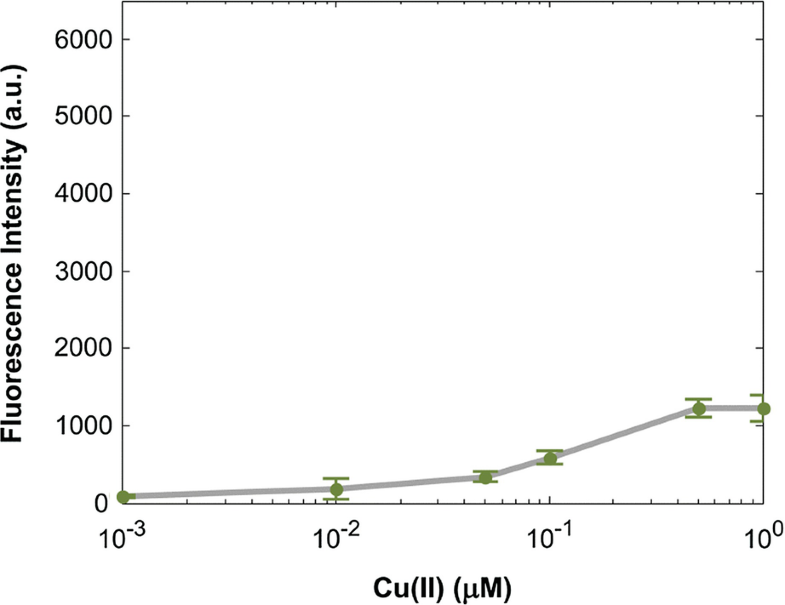 used a recombinant strain based on the specific interaction of Cu(II) with metal-binding peptide, which displayed selective adsorption of Cu(II) from aqueous solutions (Ravikumar et al. 2012). Thus, the QS-based biosensor can be combined with the Cu(II) biosorption system to promote bioremediation (see Fig. 9). where xGSS and Gss are the steady-state concentrations of immature and mature reporter proteins, respectively.